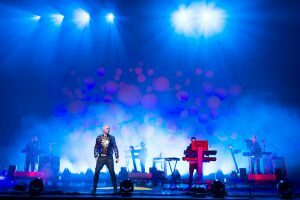 THE nostalgia industry has been all over the Eighties like a baggy Katharine Hamnett T-shirt, but in their typically detached and sniffy way the Pet Shop Boys want no part of the revival. It is unwritten band policy that they never look back. The night before our rendezvous, however, their music was all over a TV programme that ended with a dinner party of usual suspects  Ken Livingstone, Lynne Franks, Carol Decker  so I can’t resist asking who’d be on their invite list, were they ever to relax a stance so hardline you could almost call it Thatcherite. With mention of that nostalgia-party-which-wasn’t, Tennant, 54, might appear to be trumping Lowe, 49. He seems to do this quite often, or on the odd occasion the much quieter Lowe will instigate a topic, say architecture which he studied at uni, Tennant will interrupt, pick up the balustrade and run with it, if you like, and in no time at all, he’s lambasting Prince Charles for persuading the Qatar royal family to reject Richard Rogers’ design for a modernist redevelopment of Chelsea Barracks. So what’s it like, spending an afternoon with the indestructible Pet Shop Boys, pop’s most successful duo (25 years, 50 million records sold)? Re game shows, it’s been said they’re like an edition of Mr And Mrs, but today, in a private members’ club in west London, they more resemble an Alan Bennett play, a two-hander which for the sake of argument  Tennant is a Tynesider, Lowe Lancastrian  would be set in neutral Yorkshire, on a park bench. I expected Tennant to be like this: eloquent and vivacious and restless over a wide variety of subjects. He jumps from Nik Kershaw to the Shah of Iran. ‘I’ve got a whole shelf of books on his downfall,’ he says, meaning the Shah, not the singer of No 3 groover ‘I Won’t Let The Sun Go Down On Me’. And from there we’re on to media coverage of the recent Iranian uprising, the ‘narcissistic’ debate over CNN missing the start because it happened on an off-duty weekend, the role played by Twitter, and how newspapers ‘crop’ photographs differently, one cutting out some gung-ho grannies to completely alter perception. But Lowe is the surprise. Seemingly mute for the best part of two decades, I expected him to impersonate Gilbert or George, whichever of the living sculptures is the grumpier. But, with trademark baseball cap doffed, he’s charming and funny, never missing the chance to send up his chum, the noted aesthete, when he’s in full and flowery flow. To find out how well they know one another, I ask each what they reckon their associate would retrieve, in the event of a house fire. Perhaps Alan Bennett’s little entertainment would be called Shopping For A New Woofer, on account of the fact they met in a musical equipment emporium where Tennant, an ex-Smash Hits! journalist, was buying a £150 synthesiser. ‘This disco lad from Blackpool taught me about rhythm,’ he says. ‘I liked the Bee Gees, but had no idea how you did that stuff.’ Tennant had been writing songs for a while  ‘piano ballads’  including one about the Profumo affair which would later form the basis of their Dusty Springfield collaboration, Nothing Has Been Proved. Lowe: ‘And I was struck by how unlike any of his friends I was  the rest of them were pretentious Geordies. Via the Iraq war, the genius of Bryan Ferry, the ballet they’re scoring for Sadler’s Wells and what sounds suspiciously like nostalgia for a disappearing London (Tennant: ‘You’ll never see Boy George and Marilyn living in a squat off Tottenham Court Road again’), we eventually get round to their latest album, Yes, produced by the Girls Aloud sound-doctors Xenomania. Their tenth, it begins by them disavowing materialism and ends with a nod to Tony Blair’s valedictory ‘That’s it’. I’d love to live in a hotel, like Elaine Stritch’  and Tennant guessed this correctly. But wasn’t there a time when they conspicuously consumed? Tennant only drives in the north-east where he has a retreat (‘I never thought I’d end up back there, I wasn’t nostalgic for it’), and only to collect the morning paper. And when Lowe recalls being a passenger for the maiden voyage as a ‘dizzying experience’, I’m thinking the Pet Shops Boys really should write the play of their lives themselves, but not yet, because there’s still some clever, ironic pop to be made. What will each have played at their funeral?